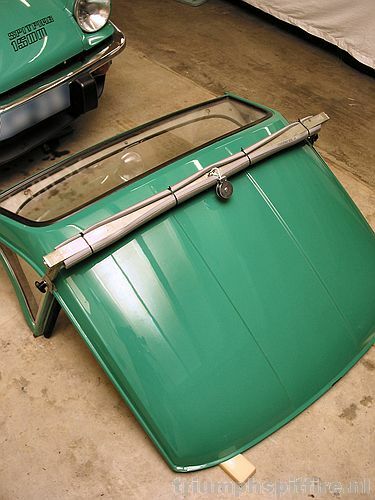 Triumph Spitfire hardtops can be useful accessories, when in use. When not in use, they can be a right pain to handle and store. Up until a few years ago, my hardtop was propped against a wall in an unused room. It took up a lot of space. 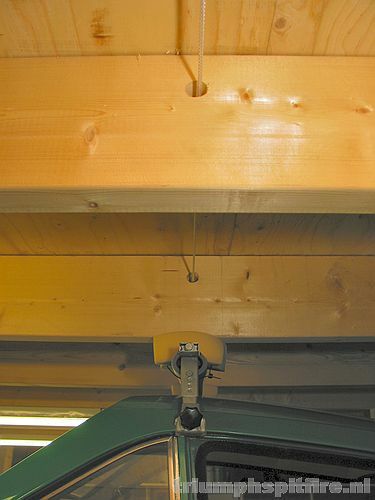 More recently, I hung it on my garage wall, using two brackets. It still took up a lot of space and I regularly bumped my head into it. It was in the way. Another problem with factory steel hardtops is that they are heavy and unwieldy things. They're an awful shape and weigh about 25 kilos or 56lb. 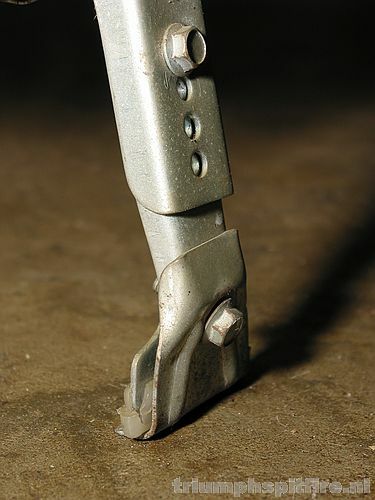 I could barely lift mine onto and off its wall brackets on my own, and I had no chance whatsoever of fitting it on the car on my own without injuring myself, the car or both. 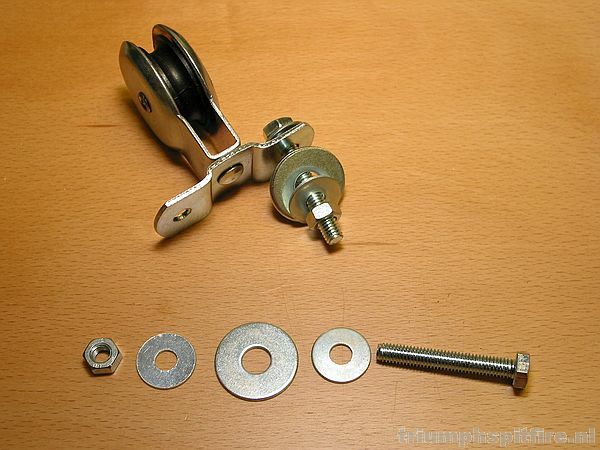 I always needed help to fit or remove it. Of course, what I really needed was a cunning plan. A plan that would solve the storing and the handling problem in one fell swoop. Being both lazy and online, I first tried to steal other people's ideas by Googling for words like 'hardtop' and 'storing'. It turned out that I was by no means the first to encounter this problem, that people had already thought of many different solutions - some of which were very involved - and that there were even people making a living out of supplying hardtop storage solutions, using all sorts of carts, winches and slings. Interesting, but not what I was looking for. 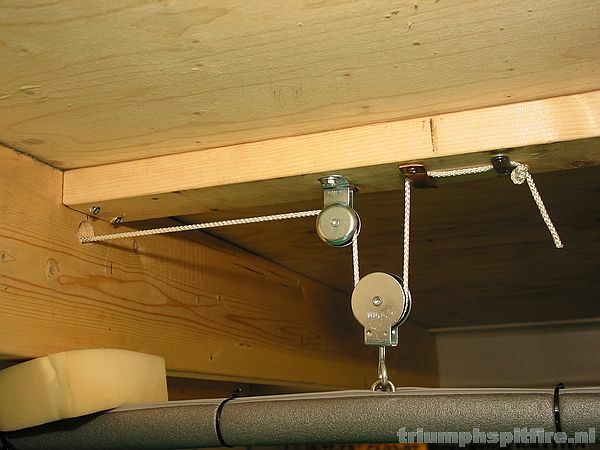 I soon decided that hanging the hardtop from the garage roof would be the best solution, but it took me a while to find a cheap, easy, safe and elegant way of doing it. While sitting idly in my garage one day, pondering about life in general and what to do with my Spitfire's hardtop in particular, it suddenly dawned on me: Triumph Spitfire factory hardtops have rain gutters. They're the sort of gutters that used to be on almost all cars up until the 1980's and which were very handy for fitting universal roof racks to. These roof racks had simple clamps that grabbed the gutter. Now I happened to have inherited one of those roof racks from my father. It was last fitted to a Renault R11 (aka Alliance) twenty years ago and was just the thing I needed. A trip to the hardware store ensured I had all the extra parts required to build my own hardtop hoist. 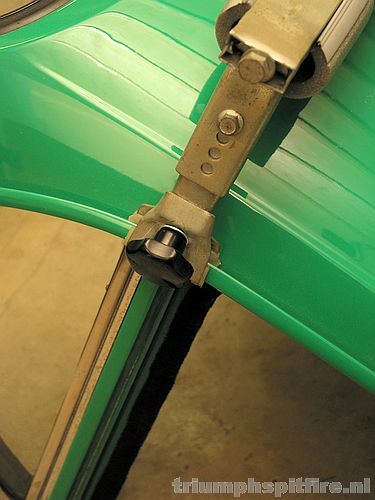 I removed one crossbar from the rack and fitted it to the Spitfire hardtop. Perfect! 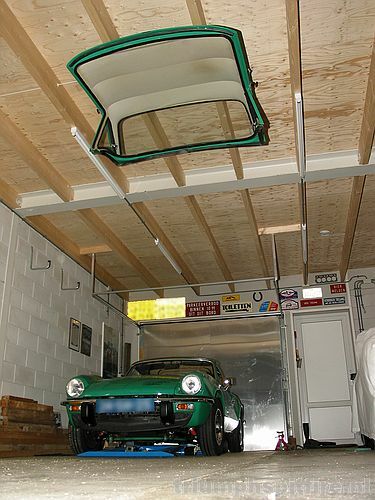 All I needed was a way to lift the crossbar and when it was in the centre of gravity of the hardtop, the whole assembly could be suspended from the ceiling. 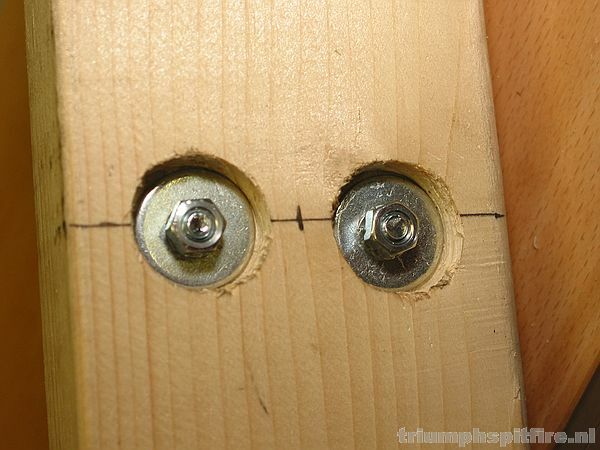 I started by fitting an eye on a plate in the middle of the crossbar, using four countersunk M5 screws and nuts. Then I attched a 50mm (2") swivelling pulley to the eye. While I was fitting and removing the crossbar to the hardtop I noticed that there was a real danger of damaging the hardtop paint. So I grabbed a length of central heating tube insulation foam and Ty-Rapped that to the crossbar. Instant protection! 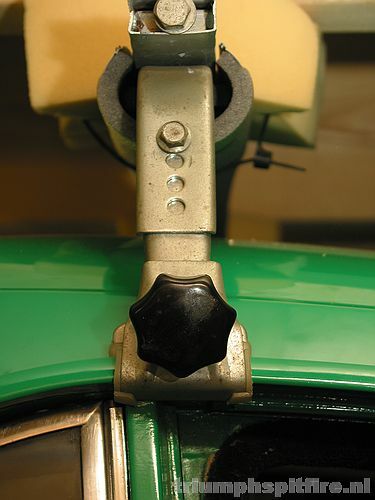 I replaced the M6 bolts on the clamps with M6 bakelite knobs. 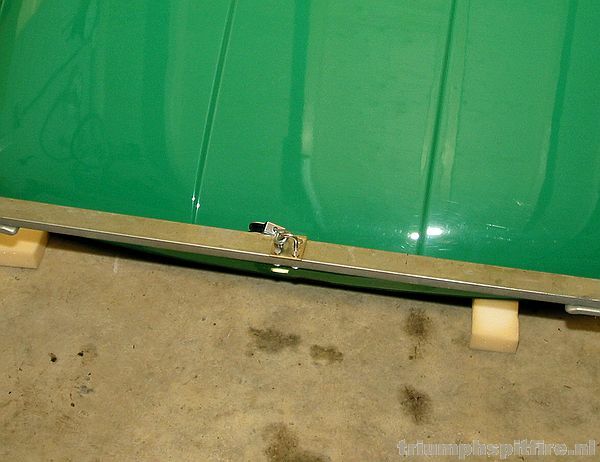 This way, I would not need any tools to fit and remove the crossbar to and from the hardtop. Now for the next part: hanging it from the ceiling. The flat roof of my garage is made up of stout wooden beams (approx. 58X190mm or 2.3"X7.5"), with 19mm plywood and foam insulation on top. The underside of the plywood is about 2.8 metres from the floor. I wanted to hang the hardtop as high as possible, but I didn't want to hang it from the plywood, beacuse I didn't trust its strength enough. And I didn't want to hang the whole lot from the bottom of a beam either, as the hoisting mechanism would take up space, lowering the hardtop too much. 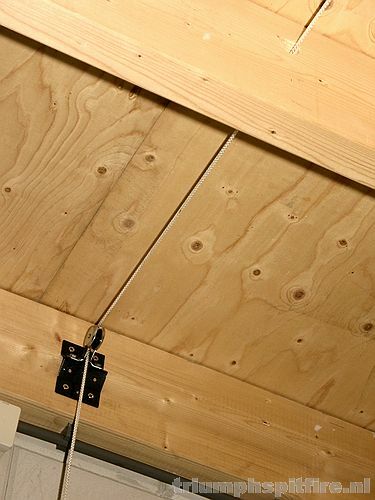 The solution was a small crossbeam, fitted between the main roof beams, right up against the ceiling. Before I screwd this crossbeam between the main roof beams, I fitted it with a small, fixed pulley, using two M6 bolts and some large washers, which sit in countersunk holes on top of the crossbeam. Of course, this was all very nice, but the roof beams run parallel to the wall on which I wanted to fit the cleat for the lifting cord. The cord would need to go through the beams to reach the wall. Right then: 25mm (1") drill to the rescue. I had to drill through three beams, before reaching the wall. Then I had to find a solution for making a right angle and bringing the cord down to the cleat on the wall. I considered just screwing a fixed pulley to the wall beam, but feared the forces could rip it loose, with only two screws to hold the pulley. I decided to fabricate a 45° bracket out of 1.5mm steel, which would direct the various forces in such a way that they could do little damage. 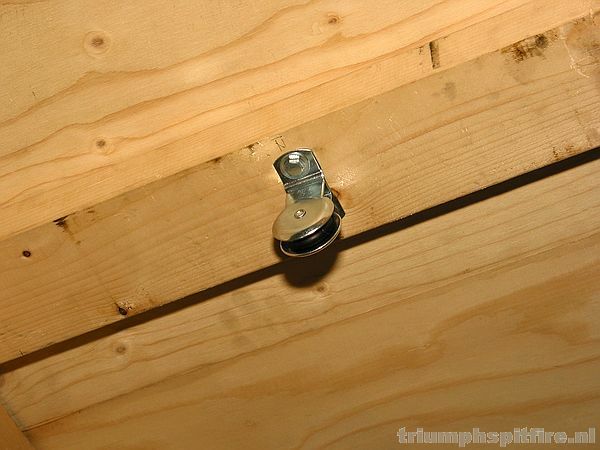 The pulley is bolted to the bracket with two M6 bolts and the bracket (spray painted with black Hammerite) is held to the beam against the wall with six long screws. That should do it. I used cord, not rope. Rope is twined and will untwine if you hang something heavy on it, so the hardtop will start spinning slowly as soon as you lift or lower it. Cord is braided and will not untwine, so the hardtop won't spin. At least not much. Because my hardtop has an inexplicable tendency to turn slightly once its lifted from the car, I used two pieces of foam Ty-Rapped on top of the roof rack crossbar. These press against the wooden roof beams to stop it from turning. I suggest you cover the hardtop with a sheet of plastic, so it doesn't get coated in dust. What you see here may not be the best solution for you. Be creative - amend as required. 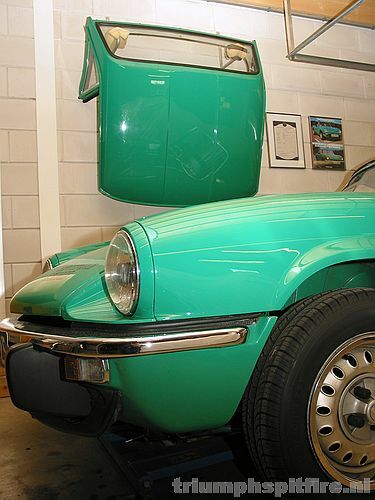 IMPORTANT: this webpage contains my personal ideas and opinion on storing a factory steel Triumph Spitfire hardtop. I am by no means an expert on storing hardtops (nor on many other things), so nothing you read here should be taken as gospel. I will not accept any responsiblity for whatever damages you or others may incur as a result of using the information on this webpage. Bear your own responsiblity. If you are unsure of what you are doing, please get help from someone who is. If you have any comments, constructive criticism or questions, please let me know.